These independent ready-to-use Syringe Filters with pes/Nylon /PTFE/PVDF membrane filters have excellent flow speed and high filtrable volume. Minisart high flow syringe filter for rapid volume sterilization with maximum user convenience.. Ready-to-use units, which offer flow rates at low inlet pressures, make a correspondingly rapid sterile filtration possible. 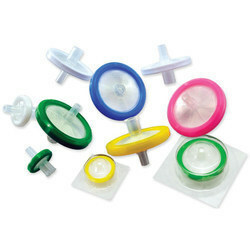 Looking for Syringe Filters ?